On 25 October 2017, the Malaysian-German Chamber of Commerce and Industry (MGCC) co-organised a conference on Smart Mobility and the Internet-of-Things (IoT) with the German Embassy Kuala Lumpur. Sponsored by the Climate Fund of the Federal Foreign Office, It brought in expert speakers and solutions from Germany, to a crowd of 200 participants. Held at the Renaissance Hotel Kuala Lumpur, the full-day Smart Cities Conference 2017 explored issues and solutions surrounding smart mobility and IoT, with a focus on best practices in Smart Electric Mobility and Smart Energy Management. It featured keynote addresses,panel sessions, interactive breakout sessions and a networking session. Gracing the event were Daniel Bernbeck, Executive Director of MGCC, and Jens Brinckmann, German Embassy Counsellor for Economic, Commercial, and Environmental Affairs. 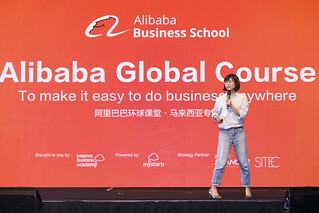 Seven keynote sessions followed the welcome speeches by the two speakers mentioned. 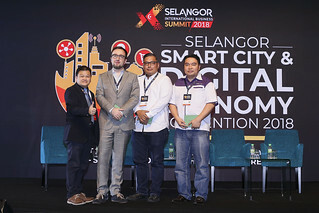 Paul Leibold, Initiator and Project Leader of ACM (Adaptive City Mobility), and Ahmad Radhi Maarof, representing the Land Public Transport Commission (SPAD), both spoke on the topic of Smart Mobility. Leibold shared about the city eTaxi solution as supplied by his organisation, ACM. Utilising a central control dashboard for control and overview, the solution involves a fleet of light electric vehicles (LEVs). “The LEVs are a development of the idea of the tuk-tuk, and runs on batteries which are swapped out manually. This further reduces the carbon footprint, as well as lowers waiting/down-time as compared to a fixed battery,” explained Leibold, adding that the system has an app similar to Uber and Grab as well. On the local front, SPAD representative Ahmad Radhi spoke about the commission’s aims for seamless travel, and shared that the current avenues being explored are shared mobility and smart mobility, of which some initiatives have been implemented. An example is the implementation of the Meteron app for safety on public transports. Tuan Hj Nor Sallehi bin Kassim, Senior Principal Assistant Director and Town Planner, PLAN Malaysia, under the Department of Town and Country Planning, Ministry of Urban Wellbeing, Housing, and Local Government, spoke about how smart city initiatives need to address pain points in cities. “Malaysian cities face rapid urbanisation, which leads to traffic congestion and overcrowding, a shortage of affordable housing, flash floods, and waste disposal issues, which in turn lead back to stress-related diseases,” he noted. Dr James Tee, CEO of Medini Iskandar Malaysia, and Najib Ibrahim, Acting Managing Director of Cyberview, spoke about urban planning and the crucial role it plays in developing smarter cities, with the duo also speaking about Medini and Cyberjaya, respectively. “We believe in sustainable green development, and are already using electric-diesel hybrid buses in Medini right now,” noted Tee, adding that a smart city goes beyond facilities and energy management. Medini has implemented green vehicles and solar panels, while also having a central command centre. High speed broadband is available, with a bikesharing program planned with oBike. Prof Dr Jens Strueker, Managing Director of the Institute of Energy Economics (INEWI), Germany, also had a keynote on real-time energy management for smart cities, where he also spoke about the use of blockchain technology, more commonly known now as a branch of fintech, to help manage energy in real time. A panel session, moderated by Prof Dr Nik Meriam bt Nik Sulaiman, Program Coordinator for the UM Sustainable Development Solution Network (UMSDSN), followed the keynote sessions. 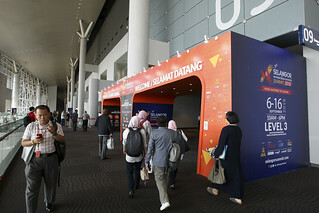 The afternoon breakout sessions, which split the attendees into two groups, discussed the use of IoT, Big Data, OpenData, Machine Learning, and Blockchain technology in digitalising, decentralising, and decarbonising cities, as well as the current state of the eMobility ecosystem in Malaysia.